The story of a great flood that destroyed the earth was not unique to the Hebrews, who recorded it in the Bible. The Sumerians, who were earlier than the Hebrews, had their own version of a great flood. Read the Sumerian Flood Myth. The Sumerian hero Gilgamesh traveled the world in search of a way to cheat death. On one of his journeys, he came across an old man, Utnapishtim, who told Gilgamesh a story from centuries past. The gods brought a flood that swallowed the earth. The gods were angry at mankind so they sent a flood to destroy him. The god Ea, warned Utnapishtim and instructed him to build an enormous boat to save himself, his family, and "the seed of all living things." He does so, and the gods brought rain which caused the water to rise for many days. When the rains subsided, the boat landed on a mountain, and Utnapishtim set loose first a dove, then a swallow, and finally a raven, which found land. The god Ishtar, created the rainbow and placed it in the sky, as a reminder to the gods and a pledge to mankind that there would be no more floods. 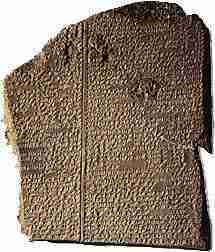 See the text Epic of Gilgamesh: Sumerian Flood Myth.